In my last post, I promised to share with you some of my favorite finds from the grocery store for emergency preparedness. Several people have commented that they prefer to stick with traditional emergency food packs like military MREs (meals ready-to-eat). Under this plan, people typically purchase the MREs, which are good for several years, from a special supplier then throw them out and replace them when they expire. There is no one right way to do emergency preparedness and if this works for you then by all means, go ahead! In my own emergency preparedness, I am hoping to use the emergency preparedness stores as a way to encourage healthy eating on a regular basis as well. My intention is to stock our emergency stores with foods that we eat (or should be eating) regularly and rotate regularly through the food, I don’t want to buy foods like MREs that we would never desire to eat outside of an emergency situation. Also, I have my doubts that my young children would subsist on MREs—at least not until they got VERY hungry. 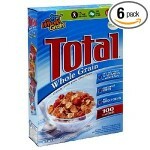 Below are my 20 best finds at a typical grocery store (or online in bulk at amazon.com) for emergency preparedness. 1) Breakfast cereal or oatmeal – Most breakfast cereals are so fortified with vitamins that you are getting a lot of nutritional punch for your calories (and dollars). Ideally, you would select a whole grain cereal with low sugar content but I believe even most sugared cereals are fortified as well. If all you did for your emergency food planning was buy an extra box of cereal and some powdered milk (see next item) you could probably survive on that for days. Ask any college student! 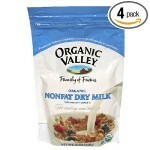 Organic Valley Organic Nonfat Dry Milk Powder. At amazon.com. 2) Powdered milk – If you are going to be eating cereal, you will need milk! Just add water to your powdered milk and you are ready to go. It tastes fairly close to regular milk. If you are allergic to milk, you could also substitute alternative “milks” like rice milk, soy milk or almond milk. I quite liked those milks until I looked at the nutritional labels one time and found that they were all basically just sugar water and didn’t have any of the protein benefit you get from cow’s milk–although they are low in fat and cholesterol. 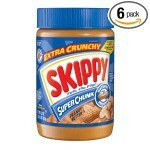 Skippy Peanut Butter, Super Chunk. At amazon.com. 3) Peanut butter – Ruth foreshadowed this one in her comment Tuesday but yes, peanut butter is a great emergency staple because it packs a ton of calories into a compact little package. 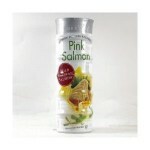 It is also full of protein, vitamin E and niacin. If you don’t like peanuts, most grocery stores carry other nut butters as well, like cashew butter and almond butter. 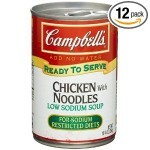 Campbell's Red & White Low Sodium Chicken with Noodles. At amazon.com. 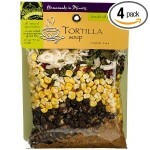 Frontier Soups Homemade In Minutes™ South Of The Border Tortilla Soup. At amazon.com. 4) Canned soup and dried soup mixes – Canned soup is one of those really basic things you might forget about for emergency planning but canned soup is really kind of like an MRE. It is usually very high in sodium so you have to watch out for that but more and more soups are being made that are lower in sodium and higher in nutritional content. If you haven’t taste-tested a low-sodium soup, you are in for a bit of a shock. You don’t realize how much sodium you are used to eating until you try a low-sodium variety. The taste is a little bland but some well-seasoned low-sodium soups are OK. This emergency staple will require heating but I can tell you from experiments with my own children that eating it cold straight out of the can (their preference) won’t kill you. There are also dried soup mixes that you just add water to and heat that are less bulky. 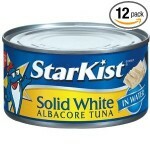 StarKist Tuna Solid White Albacore In Water, 12-Ounce Cans. At amazon.com. Bear & Wolf Pink Salmon. At amazon.com. 5) Canned seafood – We all know that fish is full of all kinds of healthy nutrients for us, particularly the esteemed omega-3 fatty acids. I most frequently hear people say, “ I don’t like fish.” If you refuse to eat fish, then obviously you will need to pick some other canned protein. I am a timid seafood eater myself but if you love seafood you can get so many types of canned seafood from sardines to clams to shrimp. The second complaint I hear about fish is that people are worried about the mercury content. My favorite kind of canned fish (white albacore tuna) is one of the fishes with very high mercury content. You are only supposed to eat a 6 oz can about once a week. The State of Alaska Department of Health and Social Services has done quite a bit of research into the mercury content of various kinds of fish, both because of the significant fishing industry in Alaska and because of the number of native Alaskans who consume large amounts of fish in their diets. Alaska Health and Human Services has created this handy chart to guide pregnant women and children (the most sensitive populations for mercury exposure) but this guide is really a good guide for anyone. According to this chart, you can safely eat unlimited amounts of “all species of Alaska salmon.” This was great news for us since one of our favorite substitutes for albacore tuna is the Bear & Wolf (Costco brand) pink wild Alaskan salmon. They manage to take all the bones out of the salmon in this brand and while the flavor is a bit stronger than tuna, it is quite delicious. 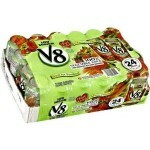 V8 Vegetable Juice Low sodium. At amazon.com. 6) V8 juice – One of the harder foods to obtain in emergency food stores are fruits and vegetables. V8 juice, particularly the low-sodium variety, gives you a large quantity of vegetables in an easy-to-drink container. 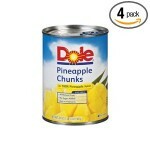 Dole Pineapple Chunks in 100% Pineapple Juice. At amazon.com. 7) Canned pineapple in juice – You could really use any canned fruit in juice but the only fruit I can reliably find that is not packed in a sugar syrup is pineapple. This emergency staple doubles as both a juice and a fruit! I especially love it cold and keep it in my fridge (but I realize that in an emergency, room temperature is the more likely alternative). 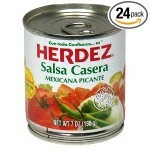 Herdez Salsa Casera. At amazon.com. 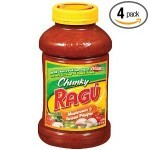 8 ) Salsa – Salsa is another great way to get your vegetables in and add some flavor to your meals as well. You have to watch your sodium content here but chips and salsa are a great shelf-stable snack. 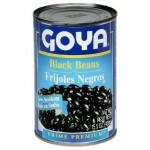 Goya, Bean Black Low Sodium. At amazon.com. 9) Canned beans – Beans are a great protein source. You could also get dried and cook them yourself if you know you will have a cooking source in an emergency. Ryvita Whole Grain Rye Crispbread, Rye & Oat Bran. At amazon.com. 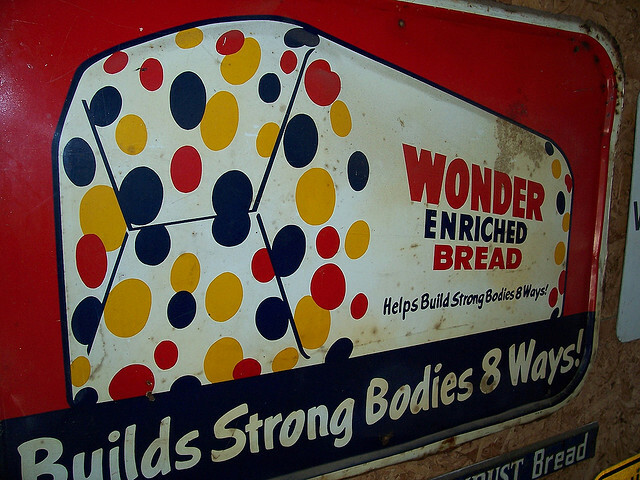 10) Crackers, Rice Cakes and Tortillas – Since I love good bread I wish there was an “emergency bread.” I have not found one yet. Instead we have to settle for bread substitutes like whole grain crackers, rice cakes, chips and even taco shells. This is the one part of my emergency storage plan I am not so happy with. I don’t want to stock up on too many high fiber crispbread crackers or rice cakes since we don’t like to eat them all that often (although we would probably be healthier for the switch). We will need something to spread all that peanut butter on for snacks. Some tortillas will keep for up to 60 days so that may be the direction we go. 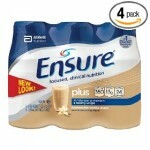 Ensure Plus Complete Balanced Nutrition Drink. At amazon.com. 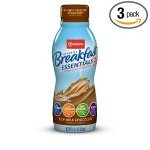 Carnation Instant Breakfast Nutritional Drink. At amazon.com. 11) Meal-substitute drinks. You generally find these in the geriatric section of the pharmacy aisle or sometimes the weight loss section. In vitamin stores, they might be sold near the muscle-building area. There are many brands of these drinks and some are quite expensive. We found a generic CVS brand that wasn’t too expensive and actually tasted pretty good. These drinks are usually free of any allergens (dairy, etc.) and are fortified with just about every vitamin and mineral you could ever need. We have used them to substitute for refrigerated breakfast yogurt smoothie drinks. They are a great grab-and-go food when you are headed into the car. Another product with slightly less nutritional content but good taste are the shelf-stable breakfast drinks from Carnation. 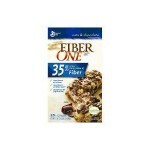 Fiber One-Oats & Chocolate. At amazon.com. 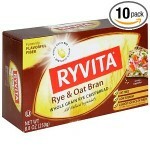 12) Granola Bars – Yes, good old granola bars are an emergency staple. Most granola bars have too much fat and sugar to really be considered healthy foods but they do offer some benefits in terms of complex carbohydrates and vitamins. If nothing else, they are a compact way to get some calories. 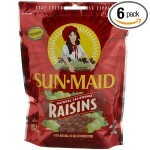 Sun Maid California Raisins. At amazon.com. 13) Dried Fruit – You can get exotic or go with a classic–raisins! 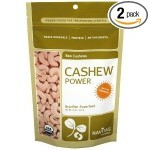 Navitas Naturals Really Raw Cashews. At amazon.com. 14) Raw Nuts and Seeds – Generally you have to shop in the bulk foods section of the grocery store to find unsalted nuts and seeds. Salted are of course delicious but when you are trying to keep your sodium down (there is salt in everything in packaged foods!) this is one area where you can cut the salt out and miss it less. Peanuts, sunflower seeds, pumpkin seeds. Lots of great choices here. Hunts- Snack Pack Pudding. At amazon.com. 15) Shelf-stable pudding! 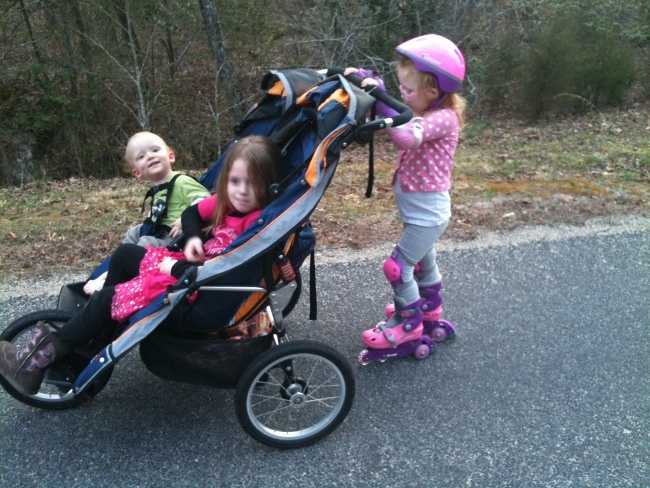 Probably an essential if you have small children. No refrigeration needed. Self-contained little cups. Some nutritional content from the milk (although it is mostly sugar, of course!). 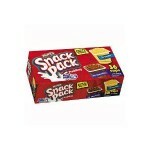 The Hunts Snack Pack brand has a shelf life of up to 540 days! 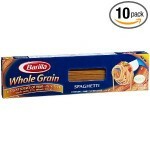 Barilla Whole Grain Spaghetti. At amazon.com. Ragu Pasta Sauce, Chunky Garden Style, Mushroom & Green Pepper. At amazon.com. 16) Whole grain pasta and spaghetti sauce. I am putting this toward the bottom of the list because this supply is useless if you don’t have a cooking source. You can’t soak pasta in room temperature water and make it edible. Since we eat pasta all the time, however, and since we have been able to cook pasta on the gas stove in at least one prior emergency, it will stay on our list. Early California Ripe Pitted Olives. At amazon.com. 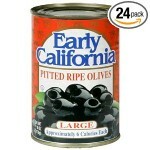 17) Canned olives. A great source of healthy fats and a good snack as well. Most small children like black olives and adults could go for a tangy variety like kalamata or manzanilla. 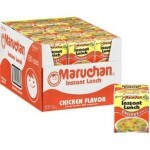 Maruchan Instant Lunch Chicken Flavored Noodle Bowls. At amazon.com. 18 ) Ramen noodles/Cup O’ Noodles – These are probably the most cost-effective emergency food staple. They generally cost about 30-50 cents per meal and they are warm and filling. You do need to be able to at least boil water to make them useful. They are also very high in sodium but you can control that a little if you use the ramen with seasoning packs and use less of the seasoning pack. 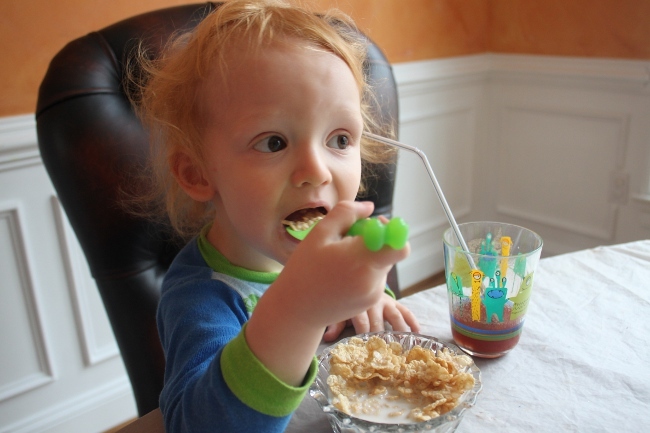 Fortunately ramen noodles are one of the foods our kids will eat reliably too. 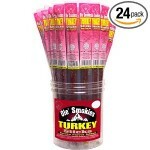 19) Jerky – Beef jerky, turkey jerkey, even ostrich jerky! Any meat can be dried into a jerky. While high in fat and salt, these are great pick-me-up treats particularly if you are doing high energy work. Jerky is usually pretty expensive at the grocery store so look for a sale or buy in bulk online. 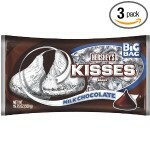 Hershey's Milk Chocolate Kisses. At amazon.com. 20) Chocolate – Chocolate is an essential survival food! There are some health benefits to chocolate but really it is more of a mental food than a physical one. Want to make a friend? Offer some chocolate. Need an escape from your stressful emergency situation. Chocolate to the rescue! There is no way we would be caught without it! So that is the list of the items our family is most likely to stockpile to create our own emergency food storage. What would you add to this list? Please share in the comments. In Tuesday’s post, we’ll try to put these foods together into a sample 30-day emergency meal plan. Have a great weekend! Emergency Food Supply Planning continued. . . Male Versus Female Nutritional Needs.